The latest addition to the Rchive is this metal inline R in a classical mode that I recently photographed in the St. James neighborhood of London. It is not from a typeface, though it reminds me of the R in Weiss Antiqua. The juncture of the leg to the bowl near the stem is also similar to Futura. The pink paint makes it look as if it had been dipped in a vat of bubblegum. I wonder what its original color was. 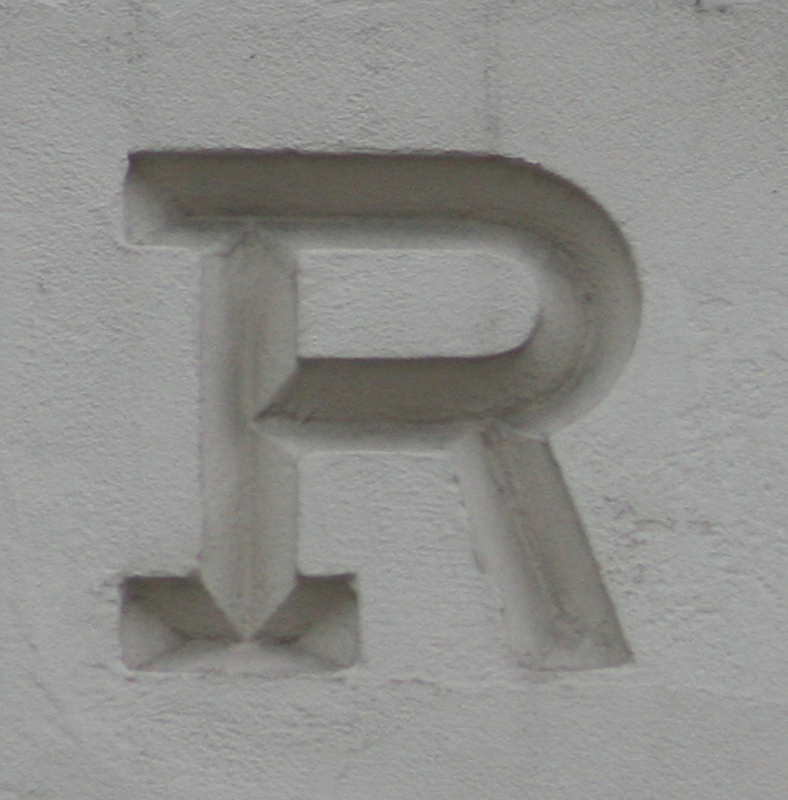 R from The Pharmaceutical Society of Great Britain building (Bloomsbury, London). Photograph 2014 by Paul Shaw. This peculiar, peg-leg R is part of the inscription on the two sides of The Pharmaceutical Society of Great Britain building at the corner of Bloomsbury Square and Great Russell Street in London. 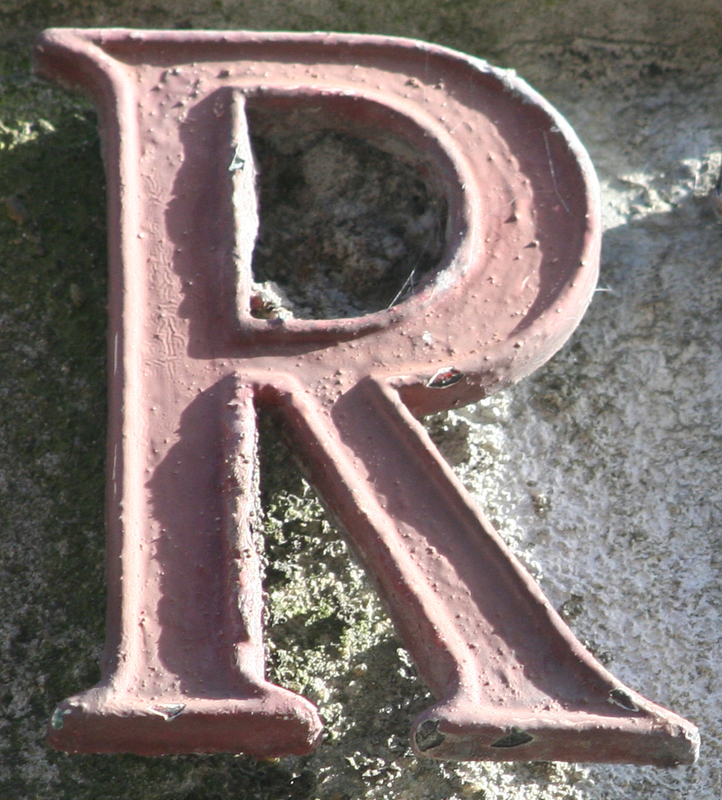 Why the R lacks a serif on its leg is unclear. Perhaps the designer was uncertain as to whether a slab serif alphabet required a serif for the R’s leg or whether it should end in a curl as in the Clarendon typeface that was created in 1845 or a ball as in a Bodoni-style face. In the end, he chose none of the above. Despite the handicapped R and the C whose top serif threatens to topple it over, the inscription as a whole is beautifully integrated into the building’s facade. The thickness of the strokes and the serifs reflects the architrave moulding that bounds it and the window frames below. The architrave itself helps to guide the eye along and makes the problems of the R and C irrelevant. Nicolete Gray, author of Lettering on Buildings (1960) would have approved. Bloomsbury Square facade of The Pharmaceutical Society of Great Britain building (detail). Photograph 2014 by Paul Shaw. The Society, established in 1841, moved to this address in 1859 and two years later added the inscription. 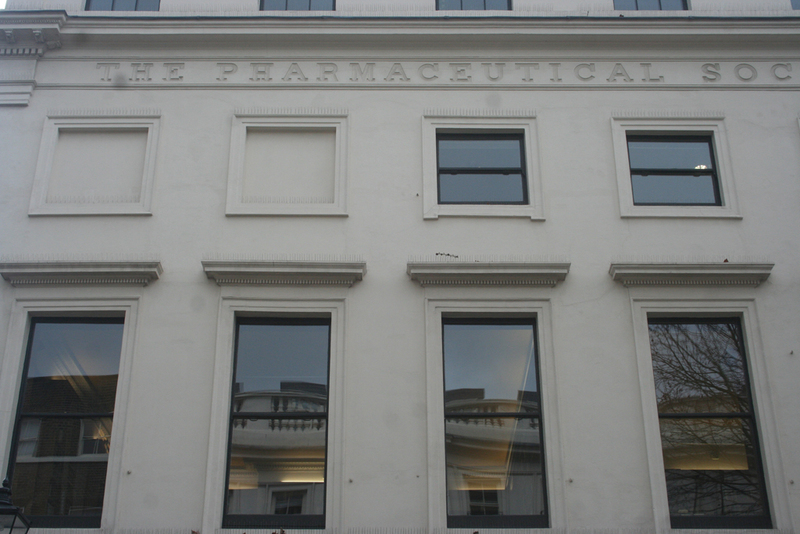 Now called the Royal Pharmaceutical Society, it moved to Lambeth in 1976. 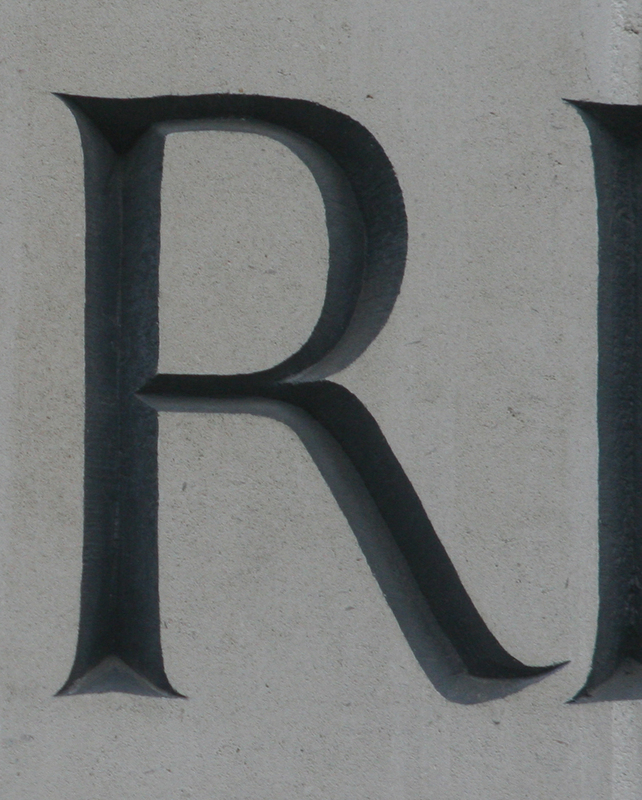 R from inscription on Haberdashers’ Hall (18 West Smithﬁeld Street, Clerkenwell, London). Photograph 2014 by Paul Shaw. This v-cut and painted R from the inscription on the front of the Haberdashers’ Hall in Clerkenwell is in the Eric Gill tradition. The key feature is its slightly curved diagonal leg. The Worshipful Company of Haberdashers is one of the Great Twelve Livery Companies in London with roots that can be traced back to at least 1446. It moved into its current premises in 2002. The inscription is a ﬁne bit of lettercutting, but I do not know who did it.